Signs of modern chivalry - the protagonist lives in a world, imagines himself to be the saviour and all the adjectives that can be used to describe the man known as a 'hero'. Walter Mitty comes across as a simple guy laced with innocence and a penchant to escape from reality; putting himself in extraordinary situations, lost in a world woolgathering with focus entirely on his escapades involving a woman caught in a web of helplessness. In an event of hopelessness and adversity, Walter is their go-to man; displaying guts of a bravado, prowess in entertainment or just about any field - he is a master of it all. The story was presented last December to the audience repackaged, keeping in mind of today's generation. 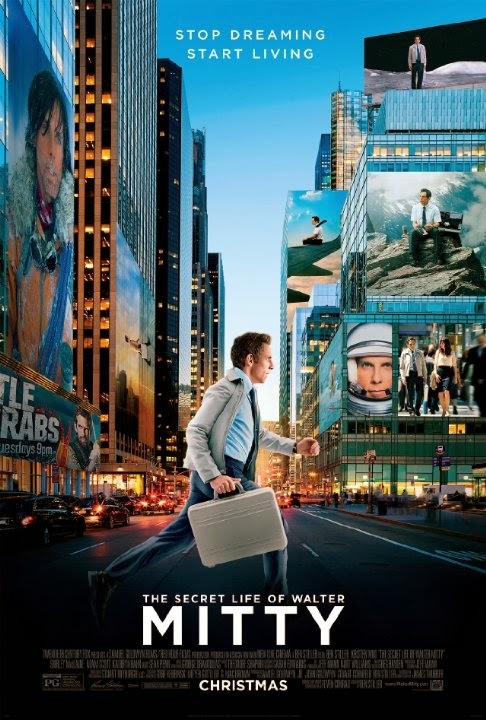 In the past week, I have the opportunity to retro-analyse this theme of Walter Mitty. 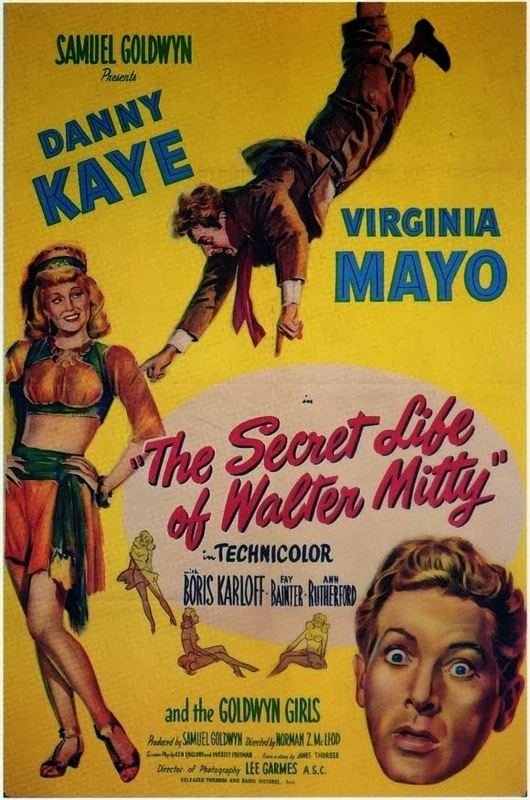 Having got impressed with Ben Stiller's direction, I watched the 1947 version of 'The Secret Life of Walter Mitty'. Both these movies were based on the character created by 'James Thurber'. It all started as a short story in 1939 for a New Yorker edition, became popular with the readers which led to few radio adaptations and a major motion film in 1947. Watching Ben Stiller and his secret life becoming public with each scene was an unbelievable experience. I was impressed by the screenplay and the breathtaking cinematography - which captured the essence and conveyed the story effectively. He is shown in America, Greenland, Iceland and Afghanistan - all this a real visual treat. Though the story was adapted for the present audience, it does a remarkable justice to this literary creation. Comparing two movies of the same theme sixty years apart is not fair. I would have been disappointed if the story had no difference between the two versions. The former movie suited the audience sentiments and the preference of producers post WW II - keeping in mind movies were business in the form of entertainment to public. Though the business element has not changed much, the preferential treatments of the same subject across different eras have evolved immensely. Right from the scene one in the original movie, the storyline and characters introduced are different from the short story. Barring for few dream sequences, the small plot of the original story has been stretched to suit the major feature film standards and the constant connection that holds the book and the movie is the adjective -Mittyesque, a condition given to unrealistic flights of fancy and escapist day dreams which the title character suffers from, possibly due to his profession of being a editor for a book publishing firm. The narration is simple, interwoven with Walter's frequent tendencies to dream about him being a symbol of heroism. Be it any profession - captain of the sinking ship, a multi-faceted surgeon, a WWII fighter pilot, a gambler, a French designer or a rodeo - he wins the heart of all and in particular a woman, who is his 'dream girl' and by coincidence turns out to be real and ends up being Mrs. Walter Mitty. The movie is an entertainer and the managment in tandem with script writers ensure there is a constant supply of comedy, idiosyncratic pantomimes and songs most suited for a actor like Danny Kaye. It is his journey in the real world - where he is constantly bossed around by his mother Mrs. Eunice Mitty, his idea-stealing boss Bruce Pierce, his kid-wit fiancée Getrude Griswald, her loud-mouthed mother Mrs. Griswald and Tubby Wadsworth, who woos Getrude constantly and shamelessly. His daily life revolves around them. Not to forget his habit of straying away to a dreamland, lost in the thoughts and actions, creating his heroic tales only to be climaxed by his transportation back to the real world. His mundane life takes an interesting turn when he meets a mysterious woman, Rosalind van Hoorn who coincidentally fits and resemble the girl of his dreams perfectly. Rosalind works with her uncle to recover the lost treasure of Dutch from WW II and Mitty accidentally becomes an important part in this rescue mission. His boring life becomes interesting and adventurous - stuff of his dreams. With all the courage previously unknown to him, he helps Rosalind and also ends up marrying his 'dream girl'. 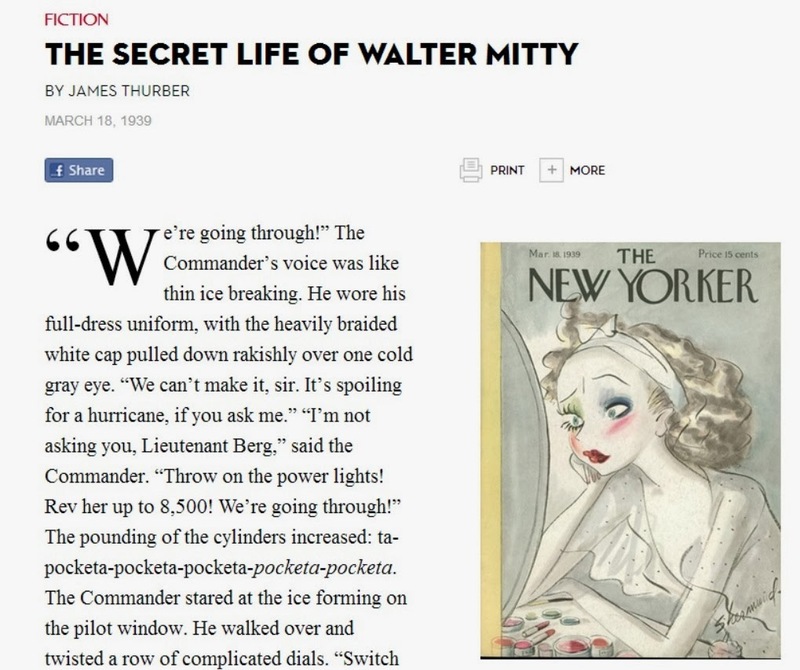 Author James Thurber based his character Walter Mitty on his friend, writer Robert Benchley. Thurber said that he got the idea for Mitty from the character created by Benchley in a series of shorts that he made for Fox and MGM, respectively, in the 1920s and 1930s. James Thurber, the author of the short story acted as a consultant for a brief period to contribute significantly to the plot which ended up in a bitter fight and the script was modified as the producer Samuel Goldwyn demanded the movie to be written to showcase Danny Kaye's talents. Thurber, who by this time was unhappy went on record saying that he hated this film and that Danny Kaye's interpretation of Mitty is nothing at all like he intended the character to be. How would he have reacted to Ben Stiller's portrayal of Walter Mitty? The 2013 movie was well made and I was mighty impressed with the treatment given to the subject. 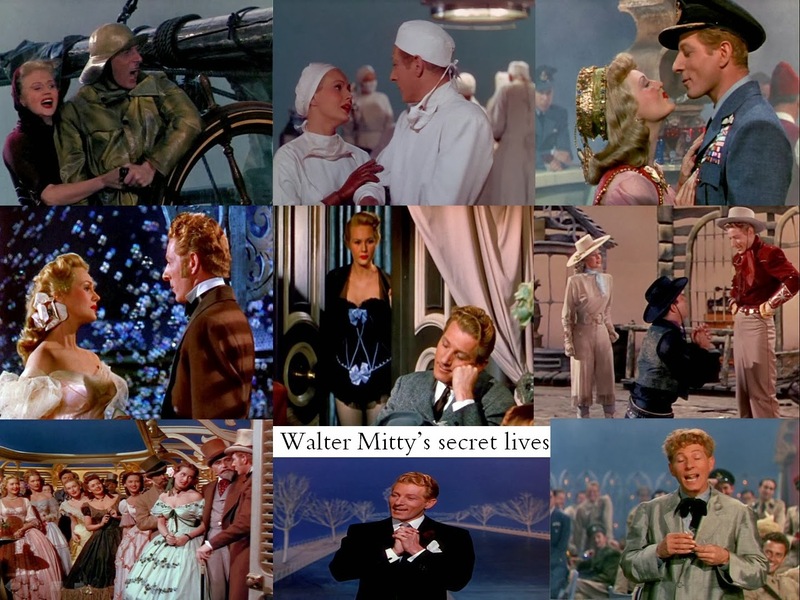 However, the 1940's was a different era and personally some of the dream sequences involving Danny Kaye were a bit of a drag and the editors could have kept it short, keeping in mind this wasn't a musical in the first place. Nevertheless, Danny Kaye performs remarkably throughout the movie displaying his repertoire as an entertainer while Virginia Mayo's presence as Rosalind and as 'dream girl' will not go unnoticed. If you can spare 110 minutes of your time and have a hint of inclination towards musical-comedies of yesteryears, then I suggest this movie to be entertaining, if not a master piece!